Originally built in 2007, this elegant 135-metre-long river cruiser joined the fledgling Travelmarvel fleet in 2014. 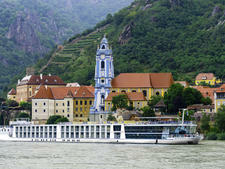 It's one of five in the Travelmarvel lineup, and cruises Europe's major rivers year round. Travelmarvel Diamond has 81 staterooms and four suites accommodating a maximum of 170 passengers. Staterooms come in two basic types, Window and French Balcony, both with 16 square metres of floor space. The seven Window Staterooms are located together on the lower Moselle Deck, and come with a deluxe queen-size bed, a desk and vanity with a hair dryer, a minibar and a flat-screen TV, a closet with a safe, a bathroom with a shower, and a view through two portholes. 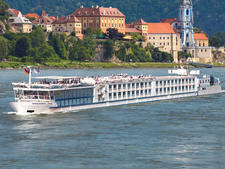 The French Balcony staterooms have an identical layout and facilities, and are distributed across the middle Danube and upper Rhine Decks, with the bonus of floor-to-ceiling sliding doors, which open to allow passengers to enjoy fresh air and views. The four Owners Suites have a midship location on the upper Rhine Deck and 24 square metres of floor space, comprising a deluxe queen-size bed, a sofa with a chair and small coffee table, a desk and vanity, a closet with a safe, and a full-size bathroom with a large shower. Other amenities include a hair dryer, a flat-screen TV, a minibar, a floor-to-ceiling glass window and a French balcony. Above the passenger accommodations is a Sun Deck with sun chairs spanning the full length of the ship, and Travelmarvel Diamond also has a lounge and bar, a dining room, a hair salon and a fitness centre. 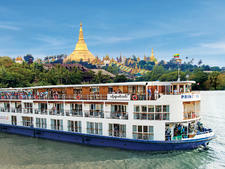 Travelmarvel caters largely to cruisers from Australia and New Zealand, offering a comfortable onboard experience with plenty of style and inclusions, as well as value for money. 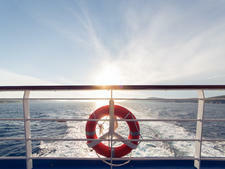 Perks include most sightseeing, fees such as tipping and port charges, complimentary use of bikes and wireless Internet. Coffee and tea is available free of charge, bottled water is provided daily, and there are complimentary local beers, wine and soft drinks included with lunch and dinner. A major drawcard is its Insider Experiences, allowing passengers to "live like a local" while gaining insights into a destination's culture and customs. Experiences can include anything from learning about the production of schnapps at a family-run distillery in Austria, to enjoying a private Oktoberfest event in Bavaria, or attending a paella cooking demonstration in Spain. Completing Travelmarvel's fleet of five ships is newly refurbished MS Excellence Queen. The ship, originally built in 2010, carries 142 passengers in 71 cabins.